Christmas memories are some of our favorites as children of the '80s. 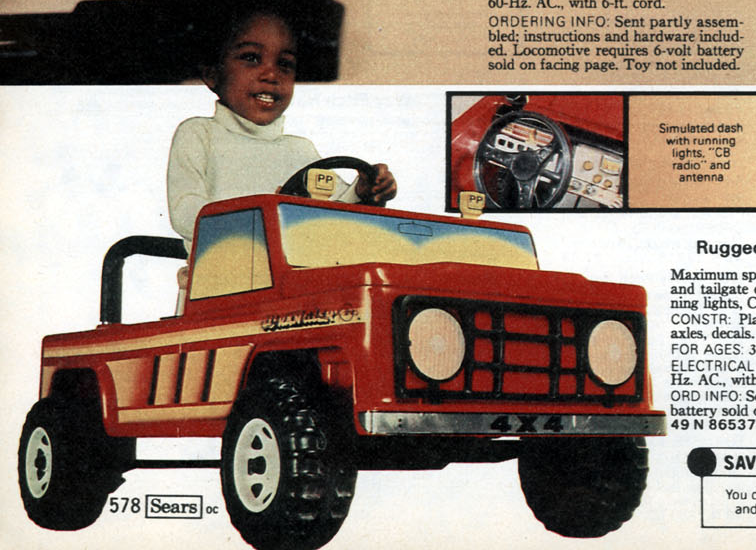 Earmarking the Sears Wishbook for the latest action figures, electronics, and toys was a necessity during the months leading up to Christmas. 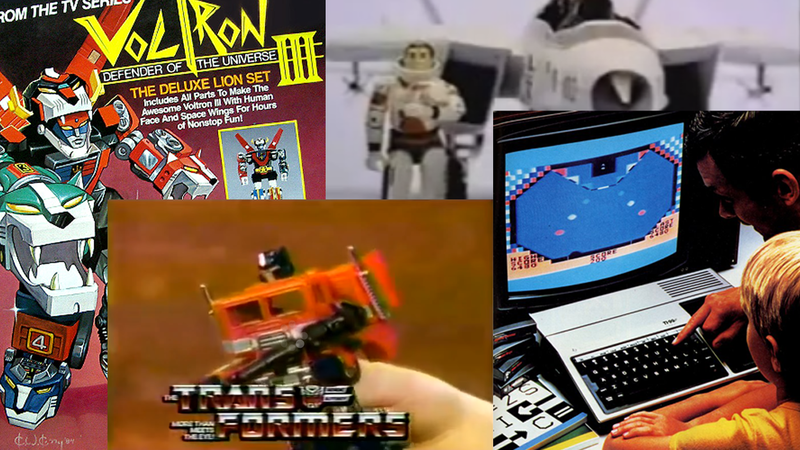 It was a great era to be kid with companies like Kenner, Hasbro, Tonka, LJN and more battling for parent's shopping dollars. The boom of animated television shows made the toy aisles overcrowded with dolls, figures, and playsets based on our favorite characters. Radio Shack had a great selection of the latest remote control cars and handheld games. The home console and computing wars of Atari, Nintendo, and Sega also gave kids a longing for the video arcade to show up under their tree. As a part of a '80s Christmas collaboration with our friends at 80s Reboot Overdrive, Return to the 80s, Weegie Midget, and Killer Kitsch, Wyatt and I have come up with our top Christmas gifts we received in the '80s. We'll be listing our Top 3 below, but if you listen to Memory Jogger Podcast Episode 4, we go a little bit deeper including a couple gifts we wanted but never received. After checking out our lists, we invite you to click over to see what the other participants listed as their favorites! Christmas of 1983 or '84 I received a G.I. 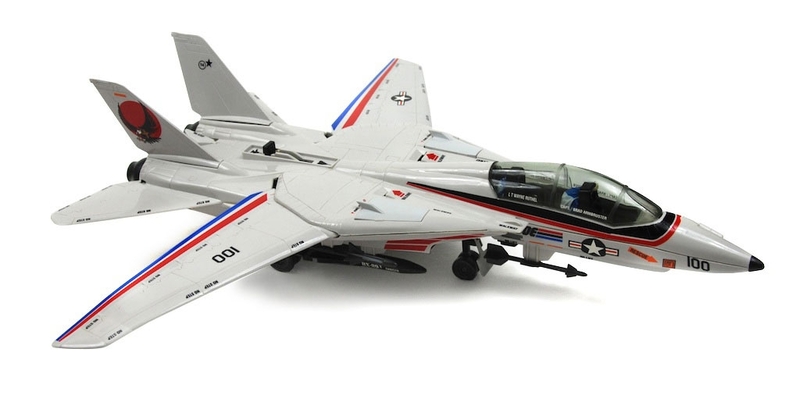 Joe Skystriker jet. I can't remember if I specifically requested but nonetheless, I would treasure it for years to come. In fact, it's the only G.I. Joe vehicle I still own from my childhood and refuse to part with all these years later. 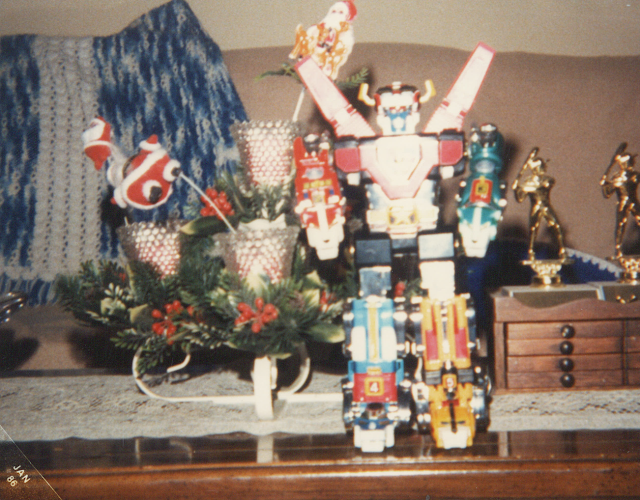 Christmas 1985, I received a transforming diecast Voltron figure that I still own to this day. I was so proud of it that I pretty much kept it under lock and key from my friends. Luckily that year, I also got my first camera and snapped a picture of my Voltron on our coffee table. Christmas 1986 or '87, I received the Thundercats Electronic Cat's Lair playset. I was an only child so it probably took a couple days to properly break it in with my neighborhood friend. 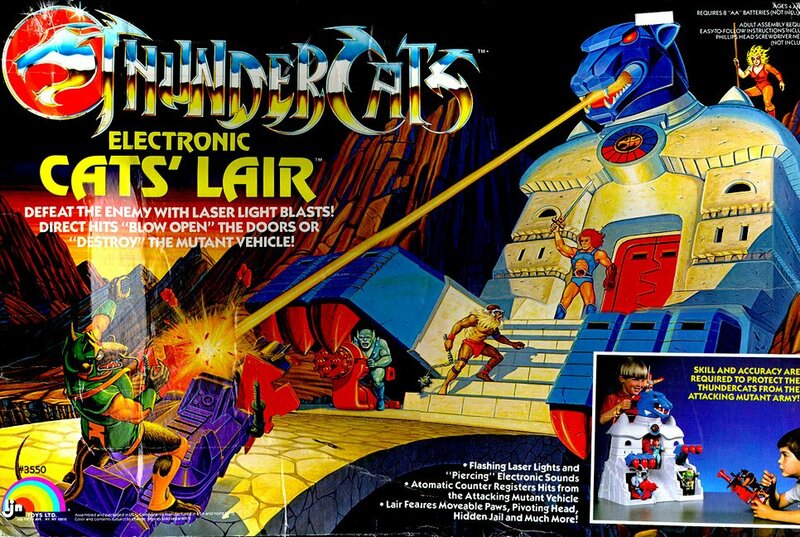 I had a few of the figures, which would be enough to make the laser light battle really fun. Unfortunately, I don't have it anymore as it was given away by my mom while I was at college. 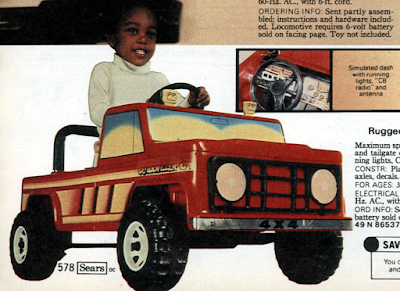 This pedal truck was my true first car. I received this as an early Christmas present and had it for, what seemed, an eternity. Before I knew exactly what I was doing, I was imitating the Duke boys by power sliding at the corner of the street and attempting to jump the plastic truck on a broken piece of our sidewalk. This truck continued to be "customized" by way of expired PA license plates and the oil change stickers. My dad continues to remind me that I had went through 2 sets of plastic tires because I drove it so much. What an odd yet amazing Christmas gift for both my sister and I. Instead of a strictly gaming console, my parents chose a personal computer so that we would learn some computer programming as well as entertain ourselves. 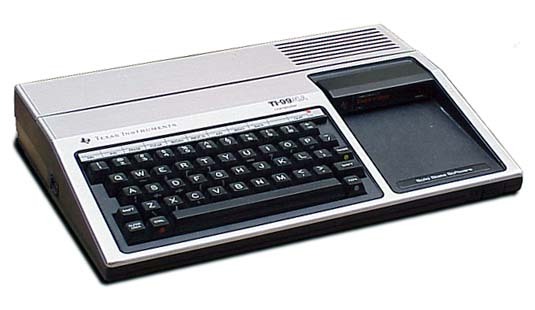 The computer came with Parsec which was a spaceship, laser shooting game and quickly became one of my favorites. In addition, we had obtained Alpiner, Hunt the Wumpus, Tank, Car Wars, Jawbreaker II, 4a Flyer, and a few other games. One of the famous lines that Jason and I still saw to each other is the Game Over voice from Alpiner, "Game Over, Press Redo or Back." 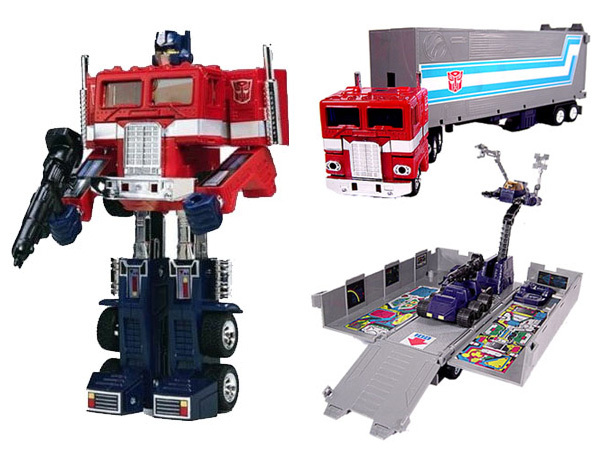 Finally, though a tough one to call third is Optimus Prime. As a Transformers fan, I know that I was elated to receive this coveted toy. Possessing Optimus felt, at times, like a rite of passage to me and I know this was played with for years by myself, my sister, and some good friends. Want even more? Listen to Episode 4 of the Memory Jogger Podcast where we talk about our lists above including two more bonus selections each, toys we wanted but never received, and some Christmas traditions!